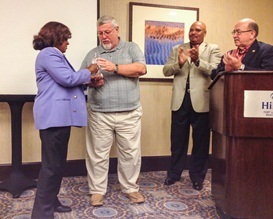 IAM General Vice President Diane Babineaux, left, Automotive Director Boysen Anderson, second from right, and International President Tom Buffenbarger, right, present retired IAM District 15 Assistant Directing Business Representative Mike Walsh, second from left, with the first-ever R. Thomas Buffenbarger Journeyman Award. IAM District 15 Assistant Directing Business Representative Mike Walsh, a 47-year IAM member, was awarded the first-ever R. Thomas Buffenbarger Journeyman Award at the 2013 IAM Automotive Conference in Fort Lauderdale, FL. Walsh was presented with a crystal award and a gold IAM watch to commemorate his service.